Dental Implants are a great way to replace a missing tooth. In the past we used bridges to replace missing teeth. Bridges still have a place in dentistry and should not be totally discounted, but in general, implants are a much better way to replace teeth. We need to remember they have other uses as well. One of the best other uses for dental implants is to stabilize a loose denture. Orthodontists also use implants to help move teeth while you are in braces. The dental implant is only 1 of 3 pieces used to replace teeth. The implant is first placed in the bone and allowed to heal. This healing usually takes 3 months, but can take up to 6 months in soft bone. Once healing has taken place an abutment is placed on the implant. The abutment is the 2nd piece of the replacement. 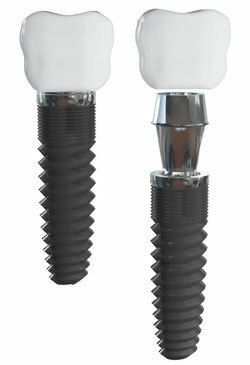 The abutment connects the crown to the implant. Often it has to be customized to the tooth replacement situation. That means taking an impression and sending it to the lab where they can customize it to the crown. Also it needs to fit, and line up with, the adjacent teeth. The 3rd and final piece is the crown. So this can be a long process. If you are lucky it can be completed in 3 months, occasionally it takes up to 9 months. The normal amount of time from extraction to implant placement to implant crown is 6 months.